As early as 2000 years BC, Moringa has been described as a medicinal herb in India. In the annals of Ayurvedic Medicine, one of the oldest healthcare systems in the world, Moringa has been mentioned as a cure for over 300 diseases. Aside from drinking its leaf extracts as tea all day and eating the leaves and pods as food all over the Indian Subcontinent, West Africa and many parts of Asia , the Romans, Greeks and Egyptians extracted edible oil from the seeds and used it as perfume and skin lotion. In the 19th century, plantations of Moringa in the West Indies exported the oil to Europe for perfumes and lubricants for machinery. It is now used to purify water and combat malnutrition in Africa and many drought-stricken parts of the developing world. Its long list of clinical benefits is amazing. In 326 BC Alexander the Great began moving eastward, intent on conquering all of India and beyond. Alexander and his forces crossed the Indus river but were halted at the Hydapes River junction by an unexpected force on the other side — the Maurian warriors. 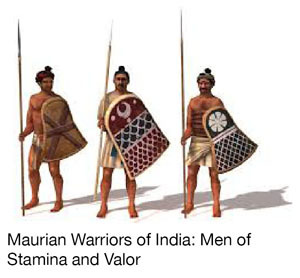 The Ancient Maurian warriors of India drank the leaf extract of Moringa as their daily staple and on the war-front. These men were known to be “men of stamina and valor”. Not only did Moringa give them the needed strength as warriors, it was a stress reliever and numbed pain. Roman historians recorded that these warriors needed less sleep and hardly got sick. They repeatedly pounced on Alexander’s armies in over 60 battles in a span of two years..
At age 29, Alexander had conquered most of the known world, creating the greatest empire it had ever seen. 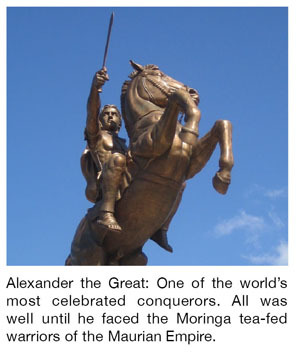 His unstoppable conquests ended with the Moringa tea drinking warriors of India. Alexander turned back to Babylon where he died in 323 BC at the age of 32 and the Maurian victors reigned for 500 more years. During those days, no one really knew the scientific basis of Moringa’s amazing nutritional and medicinal benefits. In recent years, the World Vegetable Center in Taiwan tested 120 food species. Moringa topped in terms of nutrient value! GreenEarth Heritage Foundation brings to you MORINGA, grown at the foothills of the Sierra Madre Mountains, Philippines away from contaminants, pesticides, chemical fertilizers, colorants and preservatives. Its moringa crop line, among others, has been inspected and given certified-organic status by the US Department of Agriculture (USDA) and Ecocert France. Because of GreenEarth’s holistic mission and programs in improving the lives of farming families, our foundation has also received FAIR TRADE certification from Ecocert France. 100 % of the proceeds from the sale of our moringa tea supports our farming family beneficiaries and all our programs. US tax persons and corporate entities can avail of tax-exempt benefit for their support of GreenEarth Heritage Foundation, a duly registered 501c3 organization with the US Internal Revenue Service. Philippine tax persons and corporate entities may also avail of tax exempt benefit given GreenEarth’s PCNC accreditation as a donee institution. To know more about the amazing Moringa, read its HEALTH BENEFITS.